In search of the best survival backpack? Then look no further, we have compiled a list of the bug out bags available today. There are lots of models to choose from, some with a multitude of features crammed into them and some that are just plain old workhorses without the bells and whistles. The best survival packs will be highly durable, functional and will distribute weight easily and evenly across your back and shoulders. | In a survival situation a good backpack carries your life on your back! The 5-11 Tactical Rush 72 Backpack is one of the most popular tactical backpacks available. That popularity is built on some great features and a highly regarded build quality. The 72 is the largest in the Rush range and is 2894 cu inches in volume. It's one of the bigger survival packs here and due to it's size easily doubles as a great hiking backpack for those longer hikes. ​In the darker colors it also a pretty capable hunting backpack. It's the best 3 day assault pack. If you like to keep a bug out bag at hand it can hold quite a few days worth of survival food and survival gear and you can be confident that it can withstand weeks worth of mistreatment in the dirt. Built from highly durable, water repellent 1050D nylon it is as tough as nails and can withstand quite a bit of punishment. ​One thing is for certain any kind of quality tactical backpack needs to be able to handle the most extremes of weather from freezing cold snow capped mountains to the scorching desert sun and everything else in between, and the Rush 72 handles all! The main storage compartment is a roomy 23 inch x 13.5 inch x 8.5 inch and can keep house lots of clothing or larger valuables keeping then safe and protected from the elements. Admin panel - to keep all your documents, maps and navigation equipment. Hydration pocket - for carrying your water in an external bladder. Side pockets - left and right side compartments with internal pockets. The Rush 72 is easily the best survival backpack for the money. A combination of extremely high build quality, simple to use storage compartments and great weight distribution make it the top rated tactical bag. The BFM from Camelbak is a purpose built hydration pack for military use. It holds a large 3 liter water bag which is considerably more than the majority of tactical packs out there. Boasting a large 2990 cubic inches of capacity the BFM is capable of carrying quite a bit of gear. Constructed from ​500 denier nylon the BFM is a pretty tough piece of kit. Low profile MOLLE on front panel for easy attachment points. Multiple exit ports for drink tube. Meets the USMC's requirements for hydration systems: tensile strength, burst/puncture resistance. If you are in need of a tactical hydration pack that conforms to military specs then the Camelbak is the clear winner. It is the best way to transport and distribute water in a safe and efficient manner. ​Another specialist hydration pack in our list of tactical backpacks is the Blackhawk S.T.R.I.K.E Predator. Capable of carrying 100 oz water pouch with ease. Features over 100 of Blackhawk's "S.T.R.I.K.E" webbing attachment points(essentially MOLLE). 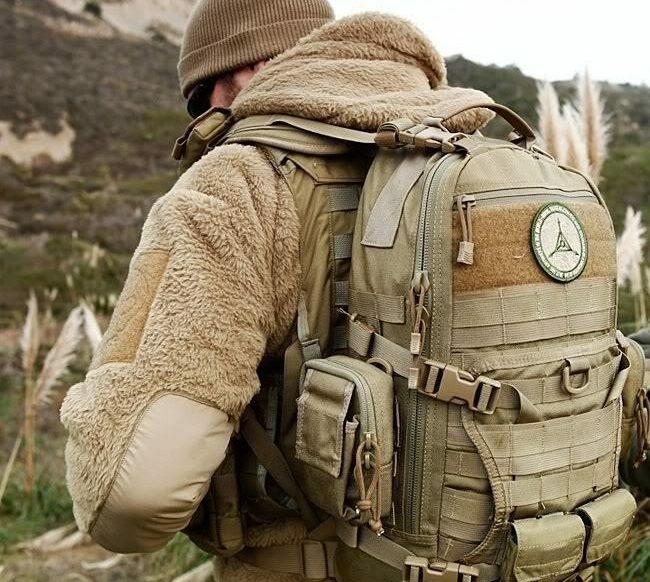 The Maxpedition range of packs have earned themselves a lot of praise when it comes to the quality of the materials and finish used. The Falcon-II is no exception. Built from tough and durable 1050 denier nylon that has been treated with a triple coat of polyurethane for added water resistance. To top it off there is a final layer of DuPont Teflon Fabric Protector added to help repel grim and dirt penetrating the nylon weave. The Condor 3 Day Assault pack is a survival backpack that delivers as a no frills, simple and great value pack. If is priced cheaper than a lot of the other packs here, however that does not mean that is to be considered "cheap". The Condor is designed for ease of use and simplicity. With seven pockets ​and a large main cargo compartment you can easily organize your 3 days worth of gear. The pack panel has individually packed foam which helps aid airflow between your back and the pad thus reducing sweat on long hikes. The Maxpedition Vulture-II is one of the more simple packs available. It has a medium sized 34 liter capacity so not quite up to a 3 day pack size. There are very few added compartments for storage. The storage consists of the main compartment, front ouch and a slip pocket. The small number of storage options really is something that can divide people over just how useful a pack is. Some prefer the simplicity and say that your packing skills are what makes it, others however need to have everything compartmentalized so that they know instantly where everything should be. A good sling pack should be lightweight have a slim, contoured profile and should be capable of providing a number of storage options. The Hazaed 4 Evac Rocket Urban Sling Pack ticks all of those boxes. ​Sling packs are great when in tight or confined spaces and the lower bulk makes them much easier to move at speed with versus a larger 3 day tactical pack or bug out bag. The over the shoulder design of a single strap means that you have much better ​upper body mobility and general agility than when using a traditional backpack with waist and sternum straps. Obviously the reduced weight that these packs can carry is both a plus point and a negative depending on your point of view and how you intend to use it. Top zip allows for longer rifle barrels or antennas. The Dragon Egg mkII gets it's name from the egg shape construction that allows for a somewhat smaller profile compared to other packs of similar capacity. Smaller height and smaller width means easier to maneuver in tight spaces and crowds. The Codura 500D fabric is ​water resistant the MOLLE on the pack front has been laser cut to help reduce water absorption unlike traditionally cut MOLLE. There is also a extremely helpful daisy chain webbing for quick attach/release of carabineers. The Velox II from 3V Gear has a roomy 1628 cubic inches of storage space that is accessed via a clam shaped main compartment. This clam shape allows the pack to open down and still retain the upright shape of the lower portion of the pack. It contains plenty of internal compartments and storage options , all of which are easily accessible in a no fuss, easy to use design. 3V also have a line of PALS and MOLLE pouches and hydration systems.​ Plus it comes with a lifetime warranty! And at one of the lower price points of most quality tactical packs it is also great value for money. Another tactical pack from Camelbak that is orientated towards hydration, the Motherlode 100 boasts a large 37 liters storage volume and like the Mill Spec pack above also houses a 3 liter water reservoir. This survival back is all about hydration, it comes with what is probably the largest fill port available. That being said it still delivers as a highly competent all rounder​. Choosing the best survival bag for your needs does not need to be too complicated. However, there are hundreds of models available to purchase. Some of which make for incredible packs that are a joy to own and use. Some, however are not that great and are either to lightly built or are too complicated in their design to making using then easy. The best way to choose a pack is to first decide how you will be using it. There is no point in buying a large 50 liter pack if all you intend to do is use it for a day. And conversely it does not make sense to buy a small pack if you intend to use it as a 3 day pack that will have a lot of survival and tactical gear stored in it. ​When choosing a pack the amount of gear you intend to carry is likely to be the number one deciding factor in which military pack you choose to buy. Having sufficient space to carry all your gear is vital. A pack that is properly sized to your needs is vital to ensuring you have sufficient space to carry all you extra's such as emergency food or survival food, tactical gear, radio's, navigation, clothing and hydration. A properly fitting ergonomic design will make a great difference to your comfort levels especially if you intend to carry large loads over long distances. If you have a pack that is poorly designed it can add to your fatigue levels unnecessarily . Wide shoulder straps help to distribute the weight over a larger area on your shoulders. If you have ever used a pack that has thin shoulder straps you will probably already know that after a time they will start to cut into your shoulders. Waist straps help to distribute some of the load from the shoulders to the waist. With a proper waist strap it should feel like the pack is sitting on your hips and the shoulder straps are there purely for balance. A Sternum strap helps to keep the shoulder straps from splaying outwards. When the shoulder straps are kept in close together on the front of your body you will feel less pressure on the front of your shoulder muscles and the weight will feel more evenly balanced. A properly vented back helps to keep air flowing between your back and clothing and the back of the pack. In warm climates this can mean a significant increase in comfort level. Having a sweat soaked back for many hours is not a very pleasant thing to have to contend with. ​The majority of modern survival backpacks will be constructed from nylon. Nylon is extremely durable and can take a lot of abuse. It is not waterproof however if treated it can be water repellent and for the most ​is quick to dry. A survival backpack is something that you need to be able to rely on to no matter what the terrain or environment. Being able to transport you gear in a comfortable and safe manner is crucial in any survival situation.